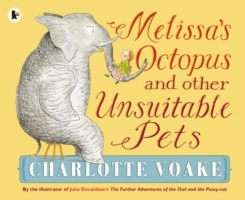 We've done favourite fiction for younger readers, the best middle grade books, activity and non-fiction for children. 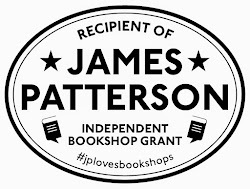 So today we'll be completing our recommends for children with picture book heaven from some of our finest authors and illustrators. 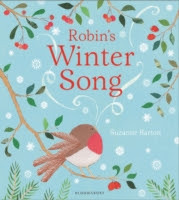 A big friend of Mostly Books, and an extremely talented author and illustrator whom we welcomed to the shop earlier this year, this is the latest book by the author and illustrator or 'The Dawn Chorus' Suzanne Barton. Her artwork is full of designs and inspiration from the world of fabric and upholstery - and are a joy to discover. The forest was bustling with activity. As the red and orange leaves swirled in the wind, Robin started to worry. Something was changing. Finch was flying south, because Winter was coming. Squirrel was burying food, because Winter was coming. Even Owl was making his nest warm. Why? That's right - because Winter was coming. Robin decided he didn't like the sound of Winter one little bit. But that was before the snow ...A beautifully tender story of a little robin's first winter. 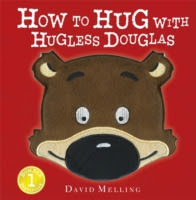 And if you don't know Douglas, come in and discover the world's mist huggable bear with other stories in the Hugless Douglas series in the shop! This is a fabulous and innovative introduction to Shakespeare and his plays. 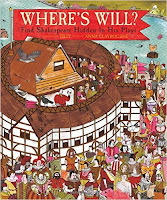 Readers meet the characters of ten of his most famous plays via colourful search-and-find spreads and snappy synopses. 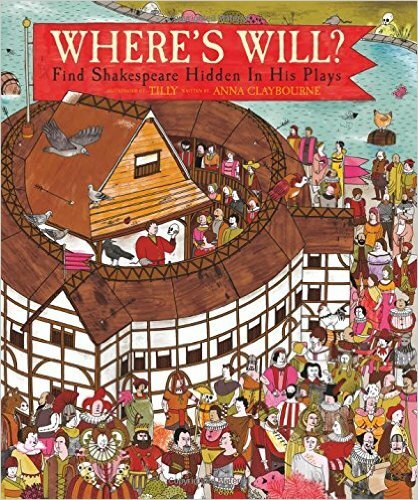 Think Where's Wally meets As You Like It. "Wherefore art thou Romeo?" You'll have to find him yourself! 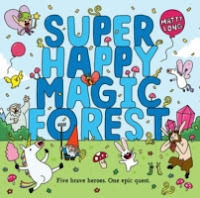 There's so much to see and talk about on every page of this hilarious story about five unlikely heroes (a unicorn, a gnome, a fairy, a faun, and a mushroom) who go on an epic quest to save their home, the amazing Super Happy Magic Forest! Bursting with jokes and details to pore over, Super Happy Magic Forest is sure to be a hit with children and grown-ups alike. 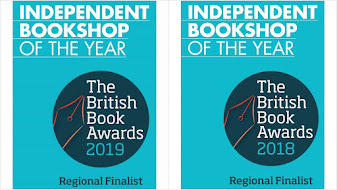 It's already caused much merriment and chuckles in the shop! Christmas is a magical time of year, when absolutely anything and incredible can happen. So when Katie and Jack are woken up late on Christmas Eve by a loud sneeze, little do they realise that they are about to embark on the most amazing evening! Soon they are flying high across London, over snow-dusted landmarks, through the star-scattered sky with the one and only Father Christmas, in his sleigh, with his magical reindeer! 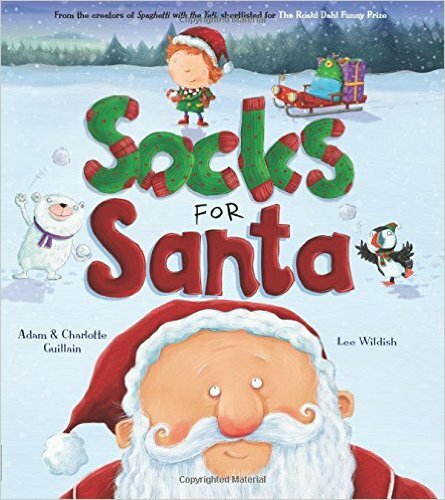 But can they help Father Christmas to deliver all his presents and be back in time for Christmas morning? 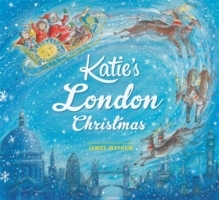 This story is illustrated with James's extraordinarily beautiful artwork and features some of London's best sights, including Big Ben, Buckingham Palace, Covent Garden and Trafalgar Square. It's very exciting when two of your favourite authors and illustrators come together, and this collaboration between Irish Children's Laureate Eoin Colfer (best-known for Artemis Fowl), and picture book superstar, Oliver Jeffers is a match made in picture-book heaven. Sometimes, with a little electricity, or luck, or even magic, an imaginary friend might appear when you need one. 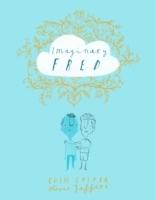 An imaginary friend like Fred...Fred floated like a feather in the wind until a lonely little boy wished for him and found a friendship like no other. It's a wonderful story on the specialness of friendship and the power of creativity. Wonderful. 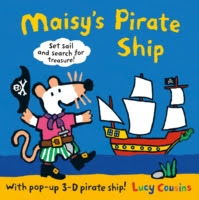 Set sail in search of treasure with this brand new, Maisy pirate adventure from the awesome Lucy Cousins. It comes with pop-up 3D ship and press-out characters. Ahoy, me hearties! Are you ready for some swashbuckling fun? Brush up on your sword-fighting, discover treasure, but beware of the sea monsters! Perfect for any pint-sized pirate, this interactive book can be easily transported to keep little ones entertained on the go - and when they've finished playing the press-out characters can then be stowed away in a keep-safe pocket at the end. Perfect! 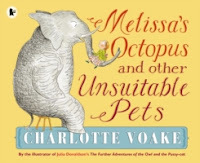 We reviewed this on BBC Radio Oxford a few weeks ago, a lovely little rhyming story, and the next adventure in the series of little ginger-haired George. He decides he's going to take Santa some presents to say thank you for past gifts, but when he gets to the North Pole - he discovers a total disaster. Can George save the day with just a paid of socks? 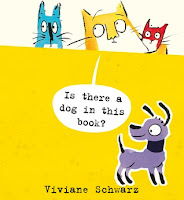 Anyone who has ever read a Vivian Schwartz picture book will have already have fallen in love with Tiny, Moonpie and André - and in this latest adventure, they suspect that a dog might have inveigle its way into the pages. What could be more scary for three little cats? But is there really a dog in here - and is that going to be so bad? With all the quirkiness, imagination, innovative page layouts and visual energy of earlier books, this is another delight - and a great book to share with children of different ages! 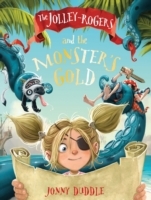 We love the Jolley-Rodger family, and in this new creation from Jonny Duddle Matilda discovers a treasure map inside an old bottle. She shows it to the Jolley-Rogers and they all set sail to find the mysterious island. Only to end up in the belly of the dastardly Pirate Cruncher! Can Matilda and the rest of the Jolly-Rogers rescue themselves before it is too late? Or will they end up trapped there forever? 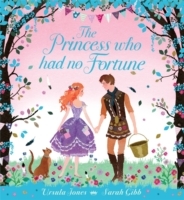 A witty and romantic contemporary fairytale of love and mistaken identity from the creators of the bestselling The Princess Who Had No Kingdom. A beautifully produced book with delicate blue foiling on the cover, with masses of appeal for anyone who loves princesses or fairy tales, boy or girl. "There was once a wolf called Wilson, who stayed up late at night. He played with all his toys until the early morning light.". 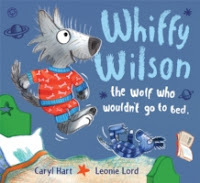 The third title in the award-winning Whiffy Wilson series, it's the perfect picture book to send little cubs scampering to bed! Whiffy Wilson thinks bedtime is boring. He wants to stay up ALL night long, playing his saxophone, building forts and learning magic tricks. Big boys like Whiffy NEVER go to sleep! Luckily, Whiffy's clever best friend Dotty is on hand with cosy pyjamas, exciting bedime stories and a yummy nighttime feast. And before long, Whiffy Wilson discovers that bedtimes are the BEST! Willful wolf pups (and little children) will soon learn to love bedtimes with this funny and soothing story. This very beautiful and lyrical extended version of the fairytale 'The Wild Swans' by Hans Christian Andersen is the much anticipated companion to East of the Sun, West of the Moon. 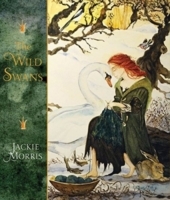 With strong characterisation of the heroine and also with more rounded characterisation of the wicked stepmother than in the original version, and with delicate watercolour paintings throughout, this is both a wonderful story and a delightful gift. Beautifully presented in a jacketed edition with a foiled title. Suddenly he sees a flickering of light, orange and bright against the snowy ground. A house! 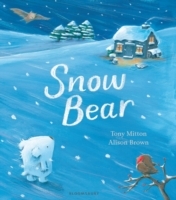 As Snow Bear pushes open the creaking door, he feels warmth spread over him. There's a girl by the window, and, somehow, deep down, Snow Bear knows that he is home. We defy your heart not to be warmed by this wonderful story. How could we not include Penguins in a collection like this? This is a gift set containing a touchy-feely board book designed specially to appeal to babies and toddlers, with brightly coloured illustrations and simple, repetitive text . 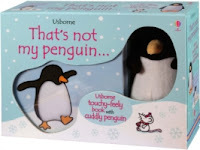 Accompanied by a luxurious, soft penguin toy which has been created specially based on Rachel Wells' illustrations. Ahh!